8.5x11, xl + 259 pp. 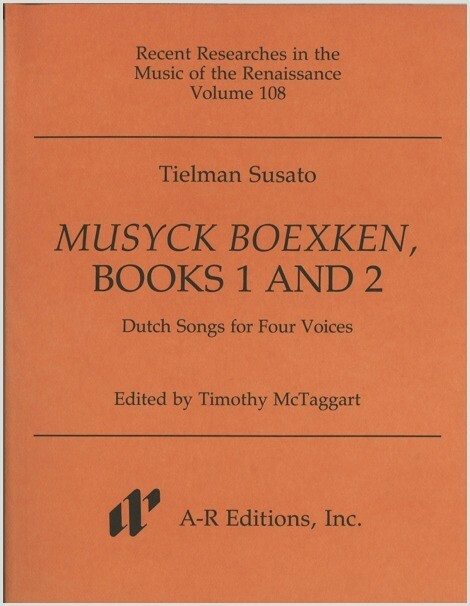 In 1551 Antwerp printer Tielman Susato began publication of his Musyck boexken, a series devoted to Dutch-texted polyphonic music. This was the most serious attempt by a sixteenth-century publisher to popularize the genre. Books 1 and 2 contain fifty-five amoreuse liedekens written in the contrapuntal style of the Netherlands school. Among the eleven Flemish composers who contributed are Josquin Baston, Carolus Souliaert, Lupus Hellinck, Jheronimus Vinders, and Susato himself. A main ingredient in this music is the enigmatic Dutch texts, which are best understood with reference to the cultural history of the Low Countries. This new edition makes available a fascinating but rarely performed repertory, which provides a glimpse into the musical culture of sixteenth-century Antwerp and the social mores of its middle-class inhabitants.